OTTAWA—The chair of the group that spearheaded the Memorial to Victims of Communism soon to be built in Ottawa says the opposition to the monument’s location reflects a lack of knowledge and understanding about the issue as well as complacency in the broader society. 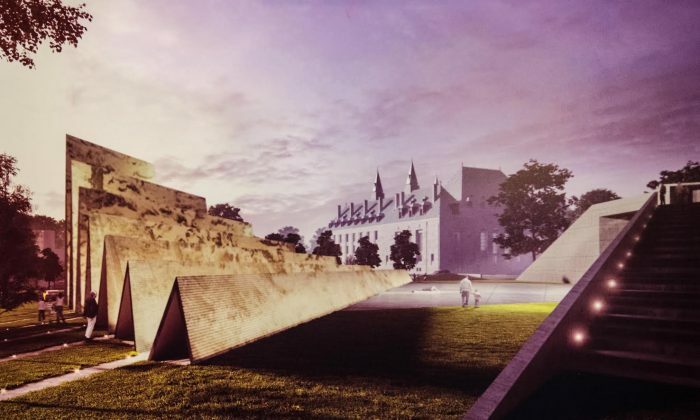 The $5.5 million memorial is slated to be built on a site between the Supreme Court and Library and Archives Canada, with construction expected to start this year. Ludwik Klimkowski, chair of Tribute to Liberty, the charity behind the creation of the memorial, says the 5,000-square-metre site is “one of the most pristine points in Ottawa” and the “right location” for the monument. “The placement right next to the Justice Building and the Supreme Court of Canada is truly symbolic. That symbolism actually allows for justice to be delivered to those who found refuge in this country,” Klimkowski said in an interview. “In terms of the narrative of our history, is this what we want to have given prominence? I don’t think it’s appropriate to have it there,” he wrote to Finley, according to the Ottawa Citizen. The placement right next to the Justice Building and the supreme Court of Canada is truly symbolic. Ottawa Mayor Jim Watson also voiced complaints about the location and the memorial, describing it as overwhelming, and saying the public wasn’t consulted. In November 2013, the commission signed off on the present site, which had for years been reserved as the future location of a new building for the Federal Court. “Some of the opponents are saying this site is reserved for the federal building,” Klimkowski said. The memorial aims to create awareness of the horrors of communism and pay tribute to the more than 100 million people worldwide who perished under communist tyranny. He points out that unlike the victims of the Holocaust, the victims of communism have never received any justice for the crimes of the world’s communist dictators. “Finally the victims of communism, their descendents—really our friends, neighbours, our colleagues at work—are getting recognition in Canada because Canada’s story is nothing but the story of its people,” he says. Klimkowski adds that those opposing the monument fail to recognize the fact that a lot of countries, such as Korea, Vietnam, and China, are still in the grip of communist regimes. He says memories of atrocities like the Tiananmen Square massacre have dimmed with the passage of time, leading people to become complacent. Roller Luo, secretary general of the Federation for a Democratic China, who came to Canada from China in 1998, says he considers himself and all modern-day Chinese victims of communism. He says the Chinese people have suffered at the hands of the Chinese Communist Party in various violent campaigns, including the Cultural Revolution, and that establishing a memorial to victims of communism at a prominent location is all the more important because it can serve as a warning. “This monument does not only serve the purpose of commemorating the victims, it also warns Canadians that imposing the communist ideology has caused catastrophe and we should not let it happen again,” he says.